If enhancing your brand and creating attention is what you are looking for, then the Feather Flags are the best form of indoor and outdoor advertising available! 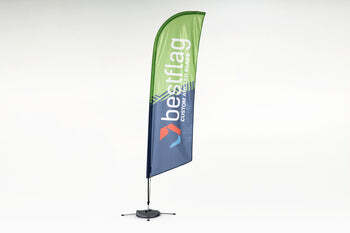 These premium flags, when used with our feather pole kits, do not need the wind to stay open! Perfect for always displaying your message and or logo. 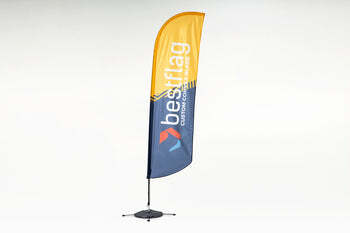 Also, when joined with the correct accessories, these flags may be used indoors, for conventions, product awareness, and expos, or used outdoors, to attract customers to your store, event or cause. Our pole sets are the strongest, most durable pole sets on the market. A combination of fiberglass and graphite allows the pole sets to bend but not break even in the toughest of conditions. Each pole set comes with a handy travel bag for easy storage and transportation. Pole set with Standard Cross Base and Water Bag - Used in a parking lot or indoor applications. The cross base works great on any surface, so it is very versatile. In conjunction with the water bag, the cross base is properly weighted for outdoor use. Select an option to upgrade your Blade Flag (Straight Bottom)!